A fascinating attempt to reconcile early explorations of the American West. 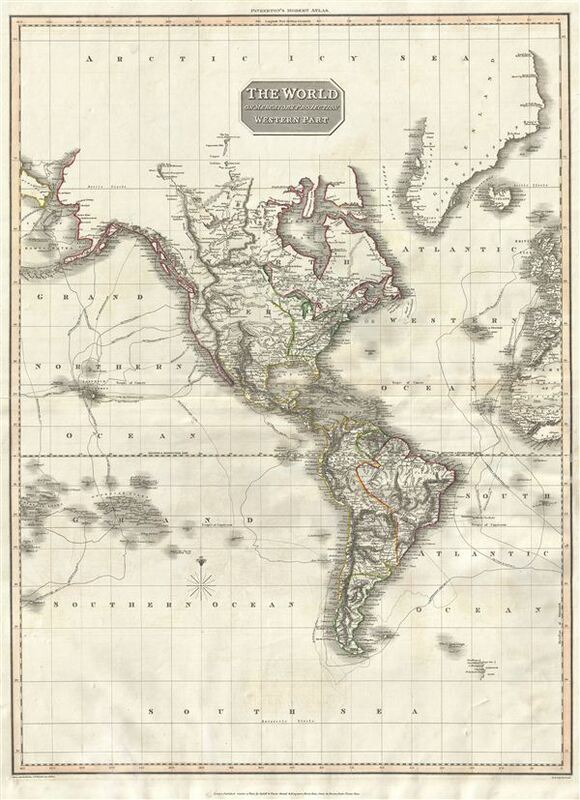 A scarce, beautiful, and exceptionally interesting example of John Pinkerton's stunning 1812 map of North America and South America. The map covers all of North American, Central America, the Gulf of Mexico, South America, and the Caribbean. It extends northwards as far as Greenland and Alaska, incorporating the full Hudson Bay, southwards include all of South America, eastwards to Europe and Africa, and westwards to Hawaii, the Aleutian Islands, and the Friendly Islands. Cartographically this map represents a notable attempt to combine cartographic speculation with new discoveries and political advocacy and is most interesting for its presentation of North America. Drawn at the height of British - American hostilities related to the War of 1812, the North American portions of this map heavily advocate for British interests. Despite being issued in 1812, the western boundary of American terminates at the Mississippi River - a clear rejection of the 1803 Louisiana Purchase. There is a reason for this. By the turn on of the 19th century, it had become abundantly clear to everyone involved that the true wealth of North America lay in the fur trade, particularly the export of beaver pelts to the infinitely wealthy markets of Asia. By this time there were two forces in the fur trade, semi-independent American traders following in the footsteps of Louis and Clark and British traders operating under the jurisdiction of the Hudson Bay Company, whose territorial monopoly they were actively extending towards the Pacific. The key to exploiting this region was control of the Columbia River, which provided an easy access point to the interior. The explorations of Louis and Clark, as well as the acquisition of Louisiana and its tentative inclusion of the as yet unnamed Oregon region put the commercial ambitions of the Hudson Bay Company's Northwest Coast wing in jeopardy. Violent clashes between the Hudson Bay Company and American fur traders working in the region were common. Here Pinkerton advocates, via color coding, for British control of all of North America north of the Great Lakes as well as the entird west coast including all of Baja California. While there is no clear overland boundary demarcation between Lake Superior and the Pacific, due to lack of a true understanding of the territory, his intention is clear - to advocate for British interests in the Americas. It is interesting to compare this with the scarce and updated 1818 Philadelphia issue of this map which proactively illustrates American interests. The problem of the Missouri was further confused by a general misunderstanding of the Great Basin and the Rocky Mountains. Here Pinkerton attempts to accommodate conflicting reports by Pike, Soulard, and Humboldt. The southern extension of the Rocky Mountains roughly follows Humboldt's impressive 1811 map of the region. Humboldt however, never truly explored the region and based his work on archives in Mexico City containing not only reports from Spanish explorers and conquistadores but also indigenous geographic information. The result was an impressively accurate portrayal of the region that was nonetheless fundamentally flawed. The Great Basin is here rendered according to Humboldt's interpretation of the 1776 Dominguez-Escalante Expedition, which was the first recorded siting of the Great Salt Lake - here rendered embryonically. Pikes Peak is marked, but not identified, as the northern terminus of the Rocky Mountains. From here we can see the apocryphal River Buenaventura, in a nod to Humboldt, flowing into the embryonic Great Salt Lake. Pinkerton optimistically imagines the Missouri and the Platte Rivers extending westward through vast gaps in the Rocky Mountains to headwaters in the Sierra Nevada Range. South of the Great Basin and west of the Sierra Nevada, Pinkerton wisely either marks the territory as 'Unknown Parts' or simply leaves the map blank. In the far north hopeful traces of the Northwest Passage remain, with the seas identified by Mackenzie and Hearne - likely the Dolphin and Union Strait - duly noted. In the late 18th century two transcontinental journeys, today little known, redefined the popular conception of the North American interior. These were the explorations of Samuel Hearne and Alexander MacKenzie, fur traders both, which, in search of profit and glory, separately penetrated the Canadian interior and in doing so became the first Europeans to see the Arctic Ocean from the shores of the North America. By traveling northward along an overland route from known territories, the work of these important explorers finally put an end to European ambitions for a Northwest Passage to the Pacific via inland waterways. Once news of their discoveries reached Europe, cartographers, including Pinkerton, were quick to update their charts, filling in a significant part of the Canadian Northwest and redefining the cartographic perspective of the region. The Pacific and Atlantic Oceans are rendered tangentally, though the map includes much of western Polynesia, including the Friendly Islands, th Society Islands, Hawaii, and Tahiti. Numerous exploratory routes are illustrate, including the circumnavigations of Perouse, Vancouver, and Cook, that last three great nautical explorers. Very good. Original centerfold. Some buckling. Else clean. Wheat, C. I., Mapping of the Transmississippi West, 1540 - 1861, 311. Rumsey 0732.062 (1812).